According to PGA.com, the two richest men currently on the Tour are Tiger Woods and Phil Mickelson. Woods has earned $112,205,724 and Mickelson has pulled in $87,617,019. Slice that into your rough for a second. We mention this only because the talk of the golf world Thursday was that Tiger and Phil have agreed to play an exhibition match over Thanksgiving weekend (Nov. 23 or Nov. 24) that will reportedly pay the winner a respectable $10 million. Mickelson nodded his head yes about it after Golf.com first broke the news. The event is expected to be held at Shadow Creek Golf Course in Las Vegas. When he was asked about it on Thursday, Woods was more coy. There is no question this event will generate a significant amount of attention. The Thanksgiving weekend usually dishes a full plate of NFL and college football, with a little college basketball on the side. But the chance to watch Tiger and Phil, reportedly wearing microphones, matriculating through a tough course with a bundle of cash sitting inside the cup at 18, certainly seems as appealing a piece of pumpkin pie. Still, major questions remain unanswered and they are important ones. Will the prize be financed by the players themselves or by the corporations sponsoring the event? And more importantly, will the winner simply pocket the prize and buy a new yacht or will the point of the event be to enrich the winner’s favorite charities? We can only hope the answer is the latter. Seriously, why would either of these guys need another $10 million? That would smack of greed and change the entire dynamic of the events appeal. “No matter how much money you have, this amount will take both of us out of our comfort zone,” Mickelson said recently. 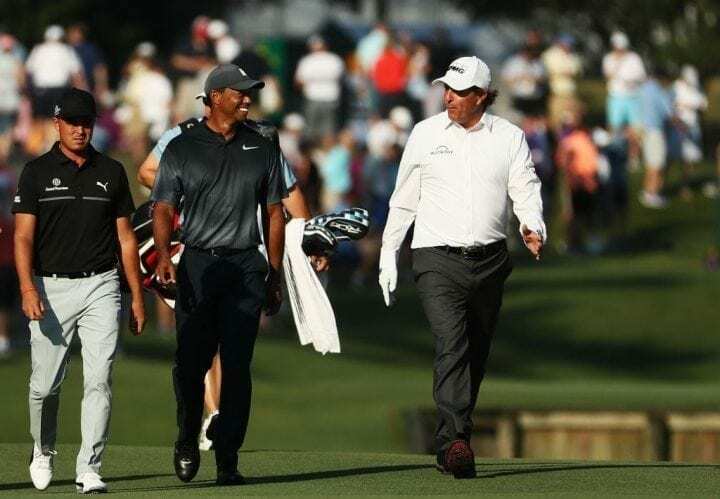 Of course, adding the human element to this is the reality that Tiger and Phil aren’t considered best buddies, dating to when they started breathing the same air in junior golf. That certainly was the case in their primes when they jousted week-to-week for titles and major championships. But Woods is now 42, has a bad back, a tarnished past and is balding. And Phil is 48, something of a recreational gambler, and has been known to do things like re-strike a putt before it has stopped rolling. With age and life’s experiences has come a more tolerant, perhaps even benevolent relationship. After all, they are their generation’s Jack and Arnie. They have won a combined 19 major championships. They have dominated the world of corporate sponsorships. They are cool. “As we’ve developed a good relationship, we’ve started to collaborate on some other things that have allowed us to achieve things that we couldn’t do on our own,” Mickelson said recently. 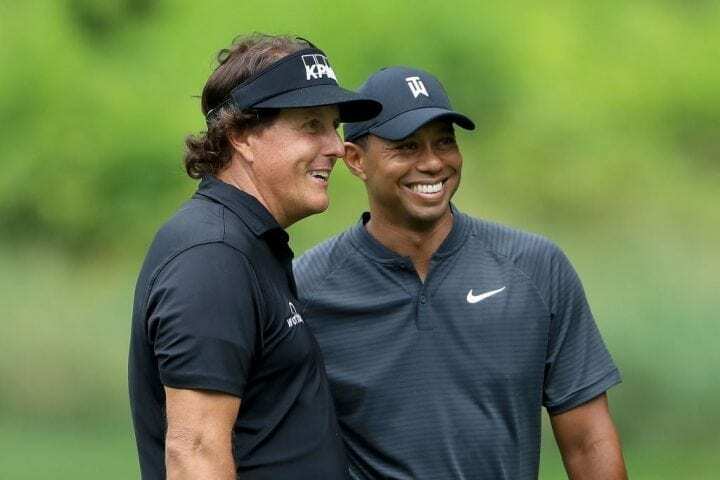 Phil and Tiger were spotted playing a practice round together at this year’s Masters and again this week at Firestone. And in May, they were together for the opening two rounds of The Players Championship in May. It was apparently during this time when the thought bubble for such a dual first appeared above Mickelson’s head.